Above - The Theatre Royal, Portugal Street, Lincon's Inn Fields, from an engraving published by Robert Wilkinson on October the 7th, 1811 - Reproduced in the book 'Shakspere to Sheridan' by Alwin Thaler published in 1922. 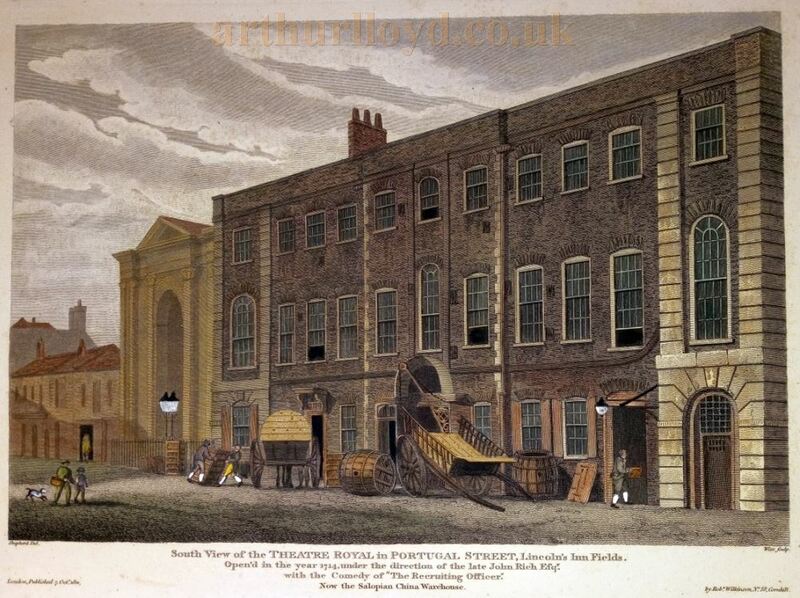 The Theatre Royal was situated on the north side of Portugal Street, opposite the top of Cary Street in Lincoln's Inn Fields, it was close to where the Peacock Theatre stands today, and where the original Duke's Theatre was situated, before its rebuild in Dorset Gardens in 1671. The Theatre Royal, Portugal Street was built by Christopher Rich and was one of the earliest Theatres to operate in London. The Theatre was opened by John Rich, the son of Betterton, on the 18th of December 1714. 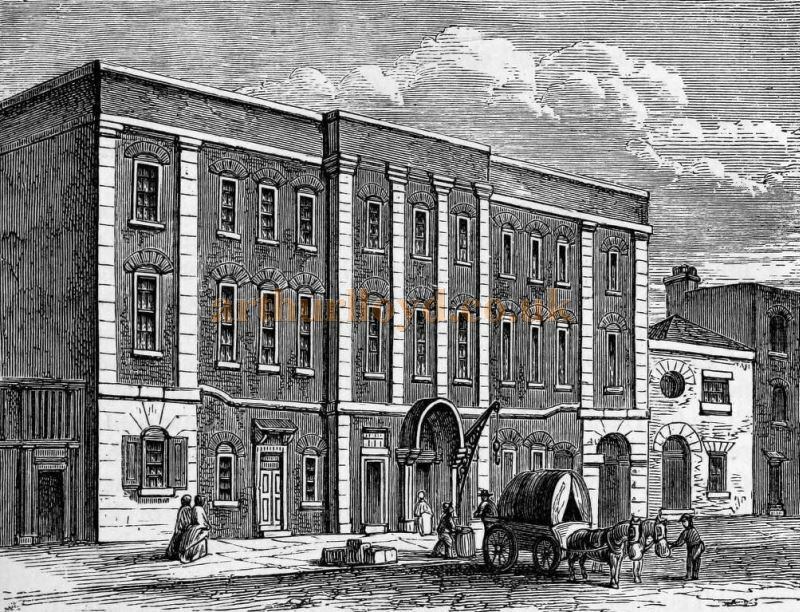 John Rich would later move to his newly built Covent Garden Theatre, today the Royal Opera House, when it first opened on the 7th of December 1732. Ironically the Portugal Street Theatre went on to stage Operas for the next two years, 1733 and 1734. After this however, in 1736 and 1737, the Portugal Street Theatre became the new home to Henry Giffard's Drama Company, who were previously resident at his Goodman's Fields Theatre. Giffard's Company were also resident at the Portugal Street Theatre again for the 1742 / 43 Seasons, and later on other occasions where their talents were required for various entertainments. Above - The Lincoln's Inn Fields Theatre in 1821, from an original sketch by F. W. Fairholt - From 'Haunted London' by Walter Thornbury 1880. The Theatre would later be converted as a Barracks and in the end became a China Warehouse for the Spode Company, later Copeland's. In 1847 the building was purchased by the Royal College of Surgeons who demolished it the following year and used the site for the construction of their own Museum, which today is much enlarged and known as the Huntarian Museum.